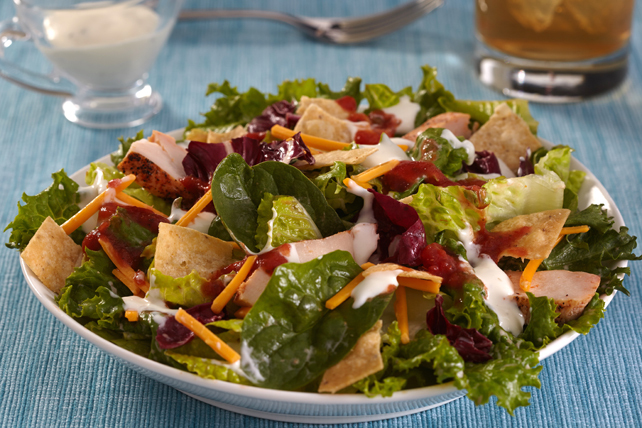 Serve this southwest taco salad of greens, chicken strips and cheddar topped with ranch dressing, salsa and crunchy tortilla chips. Toss salad greens with chicken and cheese in large bowl. Substitute 1 lb./450 g boneless skinless chicken breasts, cut into strips, for the fully-cooked chicken breast strips. Cook chicken in 1/4 cup of the salsa in large nonstick skillet on medium-high heat 8 min. or until chicken is done. Toss with salad greens and cheese in large bowl. Add remaining ingredients; mix lightly. Prepare recipe as directed. Serve wrapped in flour tortillas.